A 3D-printed SuperDraco Engine Chamber being tested by SpaceX. The company is planning to use these engines for the manned version of the Dragon spacecraft. The private spaceflight company SpaceX wants to launch astronauts into space in the coming years, and it will enter the final frontier with an innovative technology: 3D printing. California-based SpaceX is using additive manufacturing, as 3D printing is also known, to build the emergency escape rockets on its new manned Dragon spacecraft. The capsule, known as Dragon Version 2, is SpaceX's entry in NASA's competition for commercial manned spacecraft to ferry astronauts to and from the International Space Station. "The mission marked the first time SpaceX had ever flown a 3D-printed part, with the valve operating successfully with high-pressure liquid oxygen, under cryogenic temperatures and high vibration," SpaceX representatives wrote in a statement. The concept of 3D printing in space has received extensive attention in industry circles in recent months. NASA plans to send a 3D printer produced by California-based company Made in Space to the space station this year, and the European Space Agency has mused about using 3D parts to build lunar bases. Despite those plans, a recent National Research Council report said the technology is still in its infancy and that the materials science behind manufacturing in space is poorly understood. 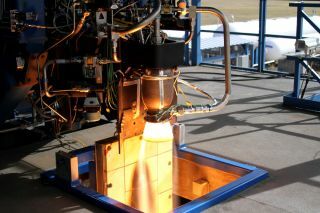 SpaceX has used 3D printing to build the SuperDraco rocket engine for the company's Dragon Version 2 manned spacecraft. The eight SuperDracos on the capsule are designed to double as a landing system, or as an escape system in the event of a launch emergency. SpaceX has spent three years evaluating the fast-growing technology, particularly for use on the Dragon spacecraft. A 3D-printed SuperDraco engine chamber, which will be used in the escape system, passed a firing test at full thrust in late 2013. "Printing the chamber resulted in an order of magnitude reduction in lead time compared with traditional machining — the path from the initial concept to the first hotfire was just over three months," SpaceX representatives stated. The 3D valve inside the Falcon 9's rocket engines will also be more efficient to manufacture, SpaceX added. After extensive testing, the 3D part is now certified to fly alongside regularly manufactured materials. "Compared with a traditionally cast part, a printed valve body has superior strength, ductility and fracture resistance, with a lower variability in materials properties," company representatives stated. "The [valve] body was printed in less than two days, compared with a typical castings cycle measured in months."